Normally, your cases are stored in a case database which is only available on your own computer. There are situations in which you would like to make some of your cases available to others. With the Case Sharing functions, you can make an export of selected cases, which can then be imported by someone else. It this situation, the imported cases become part of the other user's case database. There are however situations, in which it is not the intention to incorporate your cases into someone else's private case database. Here a Shared Case Database is the solution. A Shared Case Database is a database file, outside your personal case database. It can contain cases, exactly like your normal case database. The file is stored in the Complete Dynamics folder, under your Documents folder. It can be shared with others, by giving them the file, or by placing it on the internet. When another user copies the file to his own computer, he can open the database and has access to all the cases. To protect the information against unintended use, the file can be protected by a password. When to use a Shared Case Database. A study group with your colleagues, where you discuss cases. Servicing for a group of colleagues, while their practices are closed. Publishing a collection of cases. Working on cases by multiple people. A collection of cases, used by a training institute. 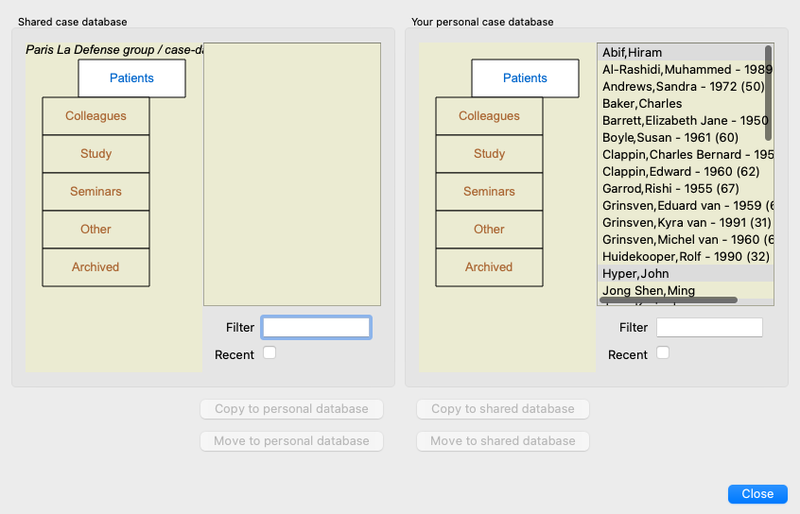 You can easily create a new Shared Case Database. (Menu option Case / Case database / Create new shared case database). You can enter a short description of the intended use of the shared cases. In order to avoid unintended access to patient's personal information, we strongly recommend you to also specify a password. Press OK and a new file will be created in your Complete Dynamics folder. The name is based upon your name, and the text you entered in the dialog field Description. The new case database is automatically opened. You can open a Shared Case Database. (Menu option Case / Case database / Open shared case database). A dialog will open, showing you the names of all Shared Case Databases, installed in your Complete Dynamics folder. Select the correct file, and press OK. While a Shared Case Database is opened, your can change its associated information. (Menu option Case / Case database / Edit case database info). Note that under group Patients, you find cases that are created by you. 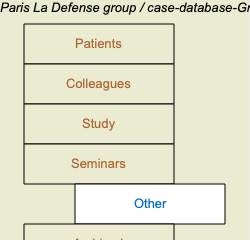 When you use someone else's Shared Case Database, you will quite likely find the cases under the Colleagues group. You can at any moment go back to your personal case database. (Menu option Case / Case database / Use standard case database). A Shared Case Database works exactly like your personal database. This means you can create cases, just like you always do. You can also use all the functions of Case Sharing, to export and import cases, or synchronize changes with other people using the same Shared Case Database. We have added a very powerful mechanism to quickly move cases to and from your personal case database. (Menu option Case / Case database / Transfer cases). On the left side, you see the cases in the opened Shared Case Database. On the right side you see the cases in your personal case database. With the buttons at the bottom, you can quickly copy or move the selected cases to the other side. Selection of the cases works exactly like you always do. In this dialog, you can select multiple case instead of a single one. Select or unselect a case by clicking on it. You can select a range of cases by dragging the mouse over the entries. When copying a case that is already present on the other side, the other case will be replaced by the one you copy.